The young woman floats in a shimmering crust of gold. Her dark head emerges, as if drowning in gold. Her look is sultry, an earthly goddess. The model, Adele Bloch-Bauer, was 26, Jewish and the wife of a wealthy sugar baron in Vienna. 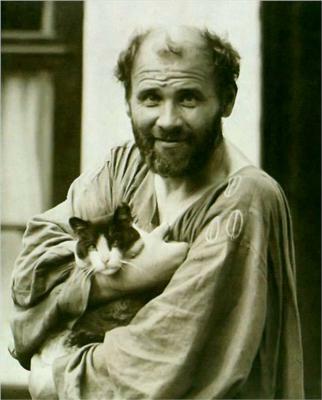 The painter was Gustav Klimt, the most celebrated artist in Austria. The year was 1907. Gustav Klimt was the son of an impoverished gold engraver. So poor was he as a boy, that he missed school for a year because he didn’t have the correct trousers to wear. But he learned about gold, and in the Vienna of the early 1900’s, gold symbolized power. Gold leaf adorned statues, uniforms, palatial estates…and Klimt’s paintings. Klimt’s Portrait of Adele Bloch-Bauer I is his most acclaimed work. Adele Bloch-Bauer died of meningitis in 1925. In 1938 Hitler and Goebbels imposed crushing and murderous restrictions on the Jews of Vienna. Their art was the first to be plundered. Adele Bloch-Bauer’s widowed husband, Ferdinand Bauer, was stripped by the Nazis of his sugar refineries, his palatial home and his art…including the brilliant Klimt painting of his wife, Portrait of Adele Bloch-Bauer I. The remarkable painting was hung in the Belvedere, the Austrian palace museum in Vienna. There was a problem, however. The title of Klimt’s painting had a Jewish name. Under Nazi regime no painting hanging in an Austrian museum could have a Jewish name. The Nazi solution: the name was changed to The Lady in Gold. The rightful owner of the glorious work, Ferdinand Bauer, escaped to Switzerland and died in poverty in 1945. Sixty-eight years later, and after a protracted legal battle between the Austrian government and the heirs of Adele and Ferdinand, the portrait was returned to the family. The Portrait of Adele Bloch-Bauer I now hangs at the Neue Galerie in New York City. Cosmetics giant Ronald Lauder bought the painting from the heirs in 2006 for $135 million. Watch this “Women in Gold” movie trailer starring Helen Mirren and Ryan Reynolds. See this terrific discussion on Klimt’s paintings. Your blogs are great and so appreciate receiving them. K. . . This one could be your best one ever!!! Thanks for sharing! Well, we must now conclude after viewing Gustav Klimt’s shimmering paintings, ALL THAT GLITTERS IS GOLD! Thanks for the reminder that Justice does indeed sometimes win out. Fabulous blog as always. Beautiful, bright colors. You have such talent you should be a professor. Thanx for the heads up on the film. Looks like a good one. Thanks so very much for your blog and the fun, high interest, information, taking me beyond my Boerne-TX-do-your-homework-life. So, so good for me. Connie and I saw that painting in the Belvedere Palace on our first trip to Vienna in the mid 70’s and its impact is still fresh. Thanks for reminding us. I never knew much about art, but you make it so fascinating. I am so proud of all that you have done with your amazing self Kirby! I met you a year or so ago with Sam at the Yacht Club. I later signed up for your Blog, and have learned so much from them. I appreciate your insight and knowledgeable appraisals of paintings and artists, and histories. You really give a lot of information that would be hard to find elsewhere as cohesively and all-inclusively presented. And, you make it so helpful to easily link to learn more. It’s palpable when art is explained by an artist. I love your Southwestern art. It really is very wonderful. Each one telling a story in such beautiful colors and shapes. I am intrigued with your comments about color and that it speaks to you so profoundly. I love color too, which I now realize is why I probably have been so hugely attracted to Mexican art since I was a child. I just wanted to say thank you to you for contributing to my continuing education. It’s something that gives me a lot of pleasure. Love the information on Klimpt! We will be in Vienna in October and look forward to seeing his work. Thanks, Kirby, your blogs are great! Thanks for the latest. Love the painting. Conflict of art, politics, racism, and resolution of sorts. The plunder of European art by the Nazi took a variety of forms. Goering had a particular direct method of thief. He had a department of art thievery assigned specifically to plunder the most precious pieces. More recently over a thousand priceless art was retrieved from a freight car – a former Goering stock pile. The sadness still reverberates. i have returned to this blog at least 4 times. i love klimt anyway, but find this blog interesting and lovely. i love lady in gold and death and life, tow everyone has to love. thank you. i am forwarding to chris. he and i saw lady in gold at the neue gallery in nyc one year, a great museum! 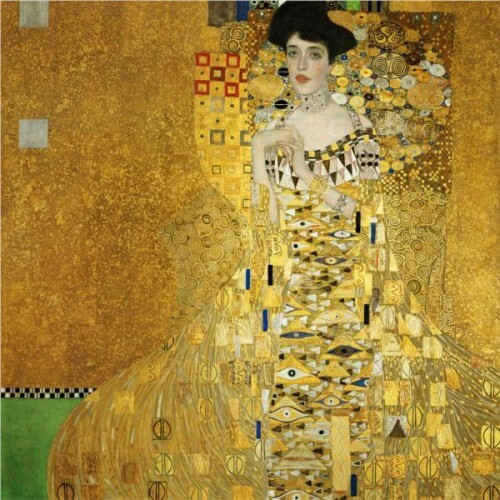 Very interesting history Klimt Woman in Gold painting. I have art books on Klimt, but this history is new. Thanks. Good writing!!! This is such an amazing story and the artwork is unbelievable. I’ve seen the artwork, however, had no idea of the history and the artist. Thanks for sharing and again enlightening me. Absolutely one of the most gorgeous works of art of all time, and one of the most fascinating histories I’ve read about any work of art. I followed the case avidly as it unfolded, and cried tears of joy when Adele’s niece, Maria Altmann, after years of legal wrangling, lived long enough to see this glorious painting returned to her and her family. I was fortunate to see it when it hung at LACMA in 2006, before it sold for 135 million and the crowds became unmanageable. This past Monday I was also fortunate to see a screening of the remarkable film starring Helen Mirren as Maria, “The Woman in Gold.” Randy Schoenberg, the brilliant young attorney who won the paintings back for Maria and her family, did a Q&A after the film, and we got to speak to him for quite a while afterwards. What a privilege and honor. 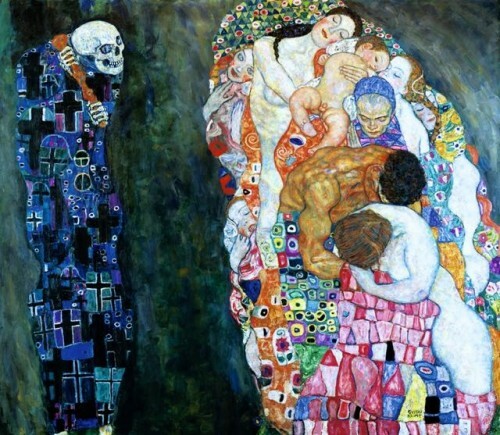 We saw this many years ago in a museum in Vienna, part of an entire room filled with Klimt masterpieces. Absolutely unforgettable.